Alice Dawson, a member of Blewbury Brass Band, is raising money to buy new music books and music related items for the newly-formed Windband at Manor School in Didcot. The more money she raises the more music related items can be bought for the children to enjoy music at Manor School. 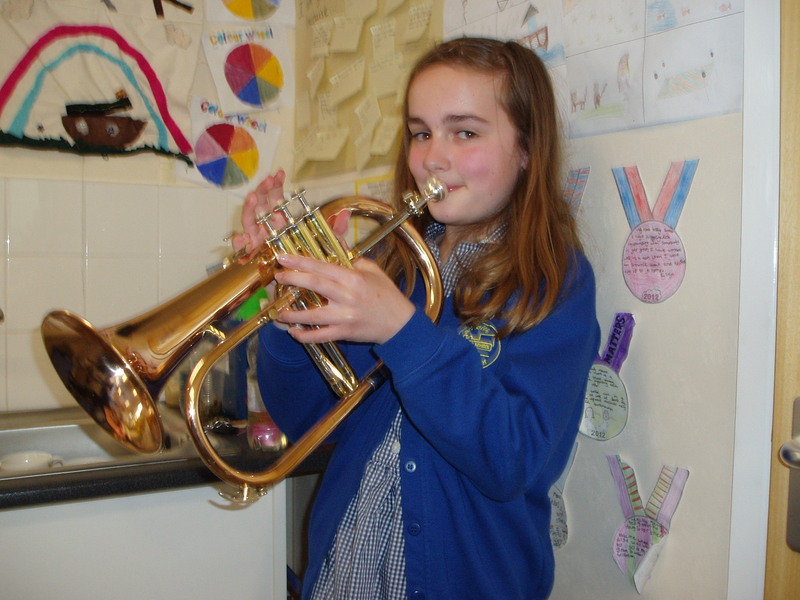 Would you please sponsor her to play a different brass instrument in each of 10 brass lessons ? As this photo shows, she has just played the flugel horn. Over the weeks, more photographs will be added to the website to show her playing other instruments. Please hand payments to the Manor School office in clearly marked envelopes, or give them to Dion Dawson at band practice, or make a payment online by BACS to bank account Sort code 30-00-02 / Account number 00972113. Thank you from Alice, and other budding musicians at Manor School.